ORLANDO, Fla. — From a distance, Chris Zaldain appeared to be casting a chunk of plywood. He retrieved it in slow motion near a boat dock on Texas' Toledo Bend Reservoir during the first week of May. His rod tip barely moved from the 10 o'clock position. "It's a glide bait," Zaldain said later. "Please don't write anything about it. These are the new thing in California." The secret is definitely out. Glide baits are now part of the long list entitled: Last Secret Bait of the Pros. A casual stroll through the ICAST showroom would convince you. 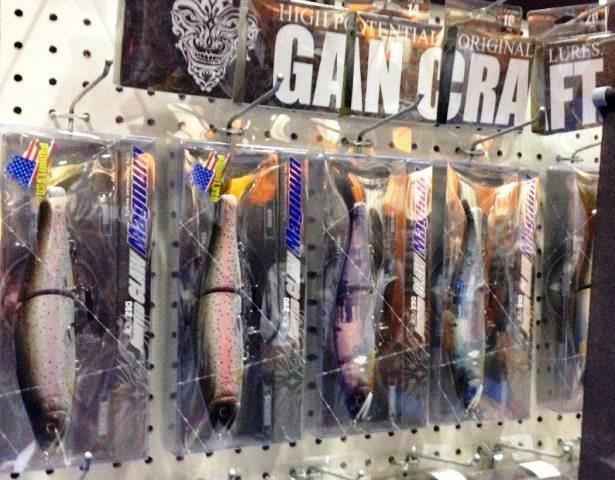 Gan Craft, for instance, featured a wall of glide baits in its booth. And plenty more lure manufacturers have added glide bait models to their catalogue. Some people call them glide swimbaits or jointed swimbaits. They come in both natural wood and hard plastic. The key feature of these lipless lures is the joint that holds the fore and aft sections together. That's what allows a glide bait to glide. It makes a wide, walking-the-dog action upon retrieve that seems to hypnotize big fish of all species. Another key: Glide baits have the unique characteristic of being both a fish catcher and a fish locator. Zaldain's experience in May at Toledo Bend is the perfect example. Bass were in all three stages of the spawn. Zaldain watched as game-changer-size bass followed behind his glide bait, but didn't bite. Knowing where the fish was allowed Zaldain to follow up with a soft plastic lure on 6-pound-test line. Much to his amazement, he was able to land the bass from a maze of aquatic vegetation. It weighed 8 pounds, 12 ounces. "If a fish sees it from 20 feet away, it's going to come up to it because they've never seen anything like that before," Zaldain sasid. "It's got anywhere from a 12- to 14-inch stride under the water. It's almost like walking-the-dog, but it's real slow and subtle. You don't jerk your rod tip." Glide baits come in all sizes – from giant 12- and 14-inch models to the more subtle 6- and 8-inch lures, and they feature different rates of fall in the water column. Zaldain is keeping it secret about who he thinks makes the best glide baits, but he doesn't mind offering some clues on to how to pick out a good one. "I think the custom wooden ones out of California have the most drawing power," said Zaldain, who lives in San Jose, Calif. "But what's most important is the balance. That's difficult to get right. When you kill it (stop the retrieve), if it falls over to the side, they won't hit it. But if it falls vertically, that's what makes it most appealing." The reel, not the rod, is the crucial part of fishing a glide bait effectively. You want something in the mid-range of speed, like 6.4:1. Not too fast; not too slow. Zaldain calls the action he puts on a glide bait "the stuck reel retrieve." It's as if you have to break through a reel that has seized. A half-crank, stop. The glide bait swims to the left. Another half-crank, stop. The glide bait moves to the right. The lure makes a wide-path, slow-motion, walking-the-dog pattern familiar to anyone who has thrown a Zara Spook, only it does it at various depths beneath the surface. "You want to retrieve it nice and slow," Zaldain said. "There's no rod action at all. Because it has one joint, as the line pulls the nose forward, it goes to one side, then it breaks and goes to the other side. It just keeps doing that, back and forth." Zaldain thinks a glide bait will be effective anytime fish are hitting a jerkbait, especially spring and fall. But this lure is so new, he's not ready to put any limitations on it yet. There's lots of experimentation left to do with glide baits. For pro bass fishermen like Zaldain, a glide bait's ability to call up fish has an obvious appeal: Bend the barbs on this two-treble hooked lure and you can determine the size of the bass holding in a particular area during pre-tournament practice. Little bass don't win big money on the B.A.S.S. circuit. If a glide bait can put bass in a show-and-tell mode, you're going to fish more efficiently during the tournament, even if they aren't chomping a glide bait. And if you're still not convinced about the effectiveness of glide baits, just ask Zaldain about the 8-12 he caught at Toledo Bend last May.